The Romans arrived in England about about 2,000 years ago. They called London 'Londinium'. The Romans invaded England in AD 43. They landed in Kent, made their way to the River Thames and sailed up it. The Romans knew it was important to control a crossing point at the River Thames, so they decided to build a settlement on the north bank. They chose a spot in two small hills and where the river became narrower. They built a bridge over the Thames, and there has been a 'London Bridge' in the same area ever since. The Romans laid out buildings, streets and a port, and shortly afterwards they built a bridge. They called the settlement Londinium. Not everyone welcomed the new Settlers. In AD 61 the native Iceni tribe, led by Queen Boudicca, rose up against the Romans. They burnt Londinium to the ground and killed 30,000 Londoners. 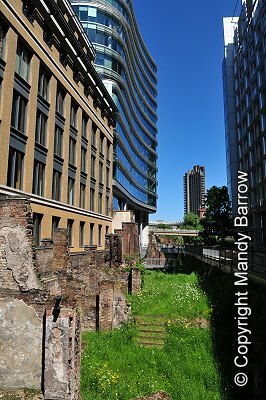 The Romans regained control and over the next 20 yeas rebuilt Londinium. By AD 100, the city was thriving again. At its peak the new Londinium city had a population of up to 60,000 people and for 300 years it was the largest city in Britannia (The Roman name for Britain). It had a fort (where the Barbican centre is now), a Forum/market, an amphitheatre (buried below the Guidhall) and Basilica/business centre. The Romans built a wall around the city to protect it from further invasion. The Romans ruled in Britain until AD 410, when thy left Britain and London. 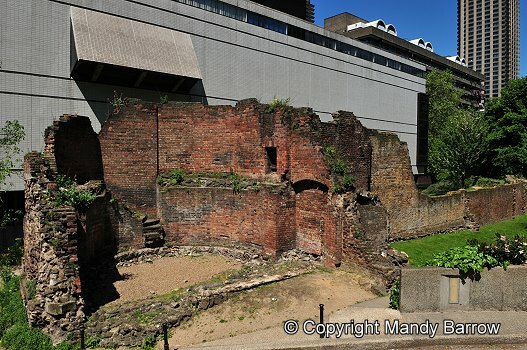 There is still evidence of Roman London. Parts of the Roman wall can still be seen. The wall enclosed an area of about 330 acres (130 ha) and had six gates. Moorgate, a medieval gate, was added later. According to ancient records the wall was three miles long, 18 feet tall, and had fifteen lofty towers (bastions). The river front side was two and a half miles long. It was built of Kentish Ragstone, brought by boat along the Medway and Thames, with bands of red tiles. 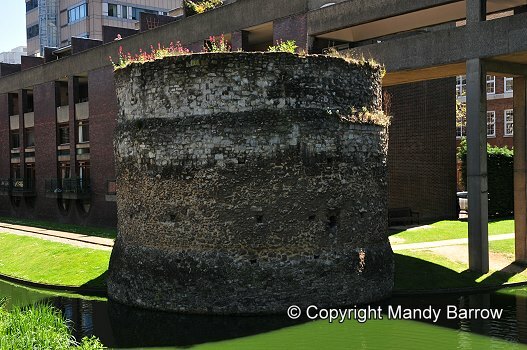 Remains of a bastion at the Barbican Estate, next to the church of St Giles-without-Cripplegate. 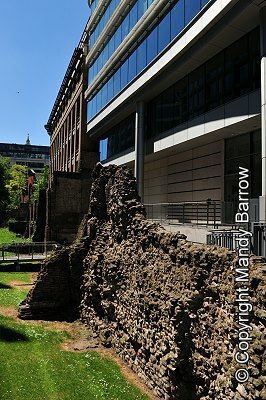 The Anglo- Saxons who followed lived outside the walls in the Aldwych area but in the Medieval period people moved back and rebuilt the walls for defence. 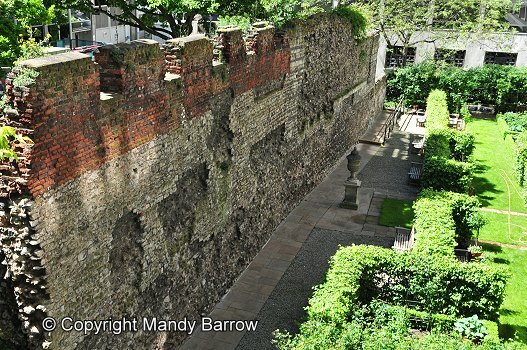 From the 17th century as London grew the walls were incorporated into buildings or used to provide materials. 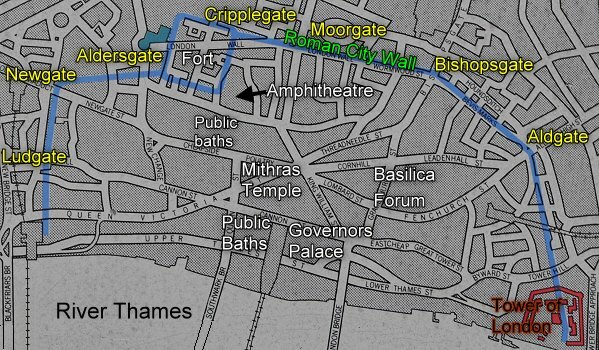 The population of Roman London was between 12,000 and 20,000. ( today it is 100 metres wide). 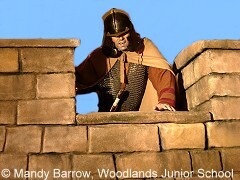 Follow this link to find out more about Roman Britain. You can see a statue of Boudicca by Westminster Bridge in London.